I admit this is an unusual building to be featured on a blog about Art Deco buildings but if you've been following this blog for any time you'll know that my definition of Art Deco is the widest possible definition and I even stray from that on occasions. 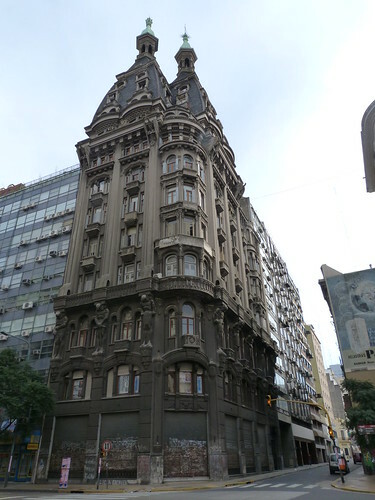 This is Edificio Otto Wulf at Avenida Belgrano, 601 in Buenos Aires. Designed by Morten F Rönnow it was built between 1912 and 1914. 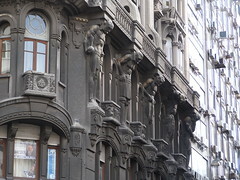 The skyscraperpage.com lists the building as Art Nouveau which fits the time of its construction and while I can see Nouveau elements I would have placed the style of the building as older. Then again, I can see areas where the decoration has be simplified using geometric shapes as I would expect to see on an Art Deco building from the 1920s. 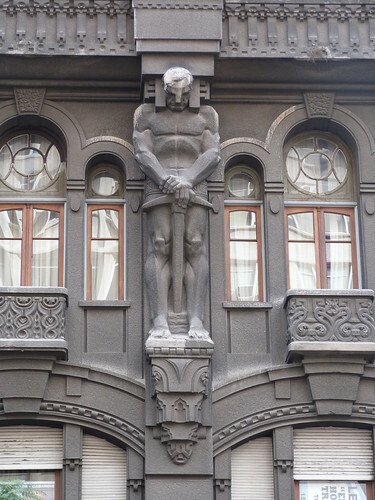 And the row of large figures on the third storey façade would be very much at home in the Deco period. The kneeling figures on the BH Town Hall?